It’s been a rough twenty four hours to be a supporter of Stannis Baratheon, the One True King of Westeros. Ever since episode nine aired, I’ve been fielding questions as to how I feel about the sacrifice of Shireen Baratheon. Anger is the appropriate emotion, though not at Stannis, but rather at David Benioff and D.B. Weiss for completely destroying one of the best characters in A Song of Ice and Fire. Ever since his introduction in season two, Game of Thrones has gone to great lengths to denigrate Stannis, portraying him as a puppet of Melisandre and a religious fanatic. The truth is, Stannis cares very little about the Lord of Light in the books. Selyse is the true believer in the Red God and Stannis appears to support R’hllor mostly because it’s just about the only thing he has going for him in A Clash of Kings. Which one might consider disingenuous until you consider that this very train of thought goes against the stubborn, rigid description of the character. Now, it’s not just D&D who feel that Stannis is a cold, brooding, and arrogant individual. Most of the characters in both the books and the series hold this opinion of Stannis. Except the opposite grows to be true. The Stannis we see in A Dance With Dragons is not the Stannis we were introduced to in ACOK. This Stannis cares little of birthrights and knows that he must save the realm to win the throne and not the other way around. I direct your attention to this image, courtesy of “The Rains of Castamere” Facebook page. 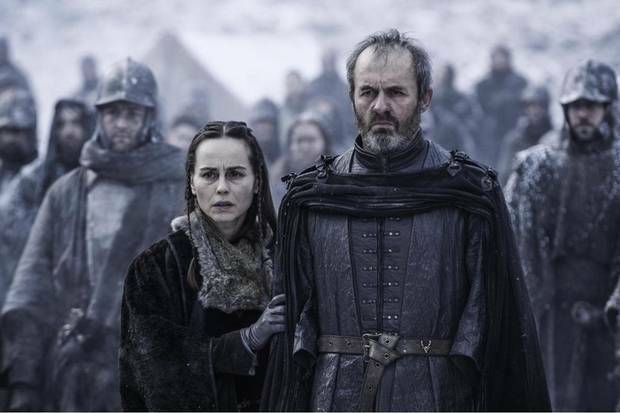 This is the Stannis that earned the title of “The Mannis.” Book and show fans have long been divided with regard to the middle Baratheon son for good reason. Show Stannis has little in the way of honor or integrity. Why? Who knows? I thought that we might have turned the page with Stannis’ horrible depiction (I won’t say portrayal since Stephen Dillane is excellent) in the show with last season’s finale. When Stannis saved the Wall, it seemed like the show finally understood the vale of the One True King. I even wrote an article about it. I now direct your attention to this quote from Theon’s sample chapter from The Winds of Winter, which is from a conversation Stannis had with Ser Justin Massey. Does this look like a man who would burn his own daughter? Certainly not. In the books, Shireen, Selsye, and Melisandre remain at the Wall. It’s been long assumed that Melisandre will try to sacrifice her and the show practically confirmed that. Why Stannis needed to be involved is beyond me. It completely ruined the character for show viewers and that’s a shame. What’s an even bigger shame is that Stannis fans now have to once again become Stannis apologists. While the show and the books have always been separate entities, it’s clear that Stannis has been a victim of this more so than any other character. 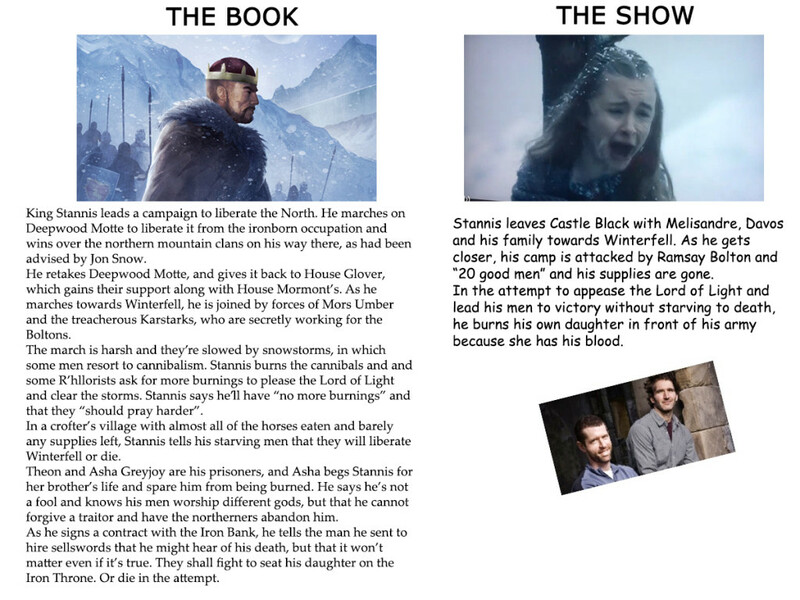 I’m not sure any book fans will be able to convince show only viewers that Stannis isn’t a completely horrible person. That doesn’t mean they shouldn’t try. While “Hardhome” went a long way in salavaging the season, it doesn’t change the fact that season five has largely been a complete disaster. When it’s not boring, it’s completely nonsensical (not to suggest that the two are mutually exclusive). Stannis isn’t the only character who’s been made to suffer the indignity of actions unbefitting to his character. There’s also Littlefinger, but at least he didn’t burn his daughter. I urge people to remember that last episode featured actions committed not by Stannis, but rather by the showrunners who don’t understand the character. I will continue to love Stannis. 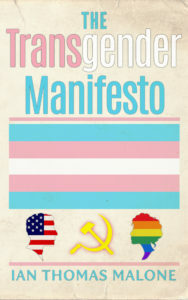 You should too. Also, Courting Mrs. McCarthy is out today!